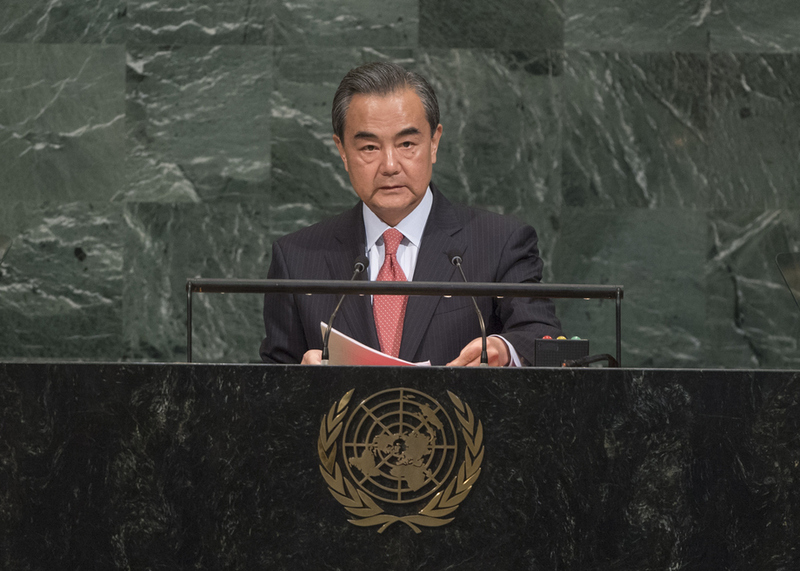 WANG YI, Minister for Foreign Affairs of China, said the United Nations had been instrumental in preserving seven decades of relative peace and helping countries enter onto the fast track of development. Today, the emergence of developing countries and an exciting technology evolution offered new opportunities, but also tensions and power imbalances. The world faced a backlash against globalization. “We are once again at a crossroads,” he said, and countries must choose between unity and division. To ensure peace, development, and dignity for all, they must embrace the United Nations as a “guardian of world peace”. Further, the permanent Security Council members should play an exemplary role in mutual respect and win-win cooperation, he said, choosing “dialogue over confrontation”, and “partnership over alliance”. The fight against terrorism required a holistic approach whereby all countries abided by law and avoided double standards. The United Nations should spearhead efforts to build a united front against terrorism in an objective and impartial manner, acting as the main channel for preventing conflicts by fully leveraging Chapter VI of United Nations Charter and engaging as a political mediator. In that context, the Geneva and Astana channels should be used as a “greater push” for substantive talks between the Syria’s Government and its opposition, he said. On the Palestinian issue, he said “we owe the Palestinians a just solution”, and called for an immediate end to violence. All efforts should be made based on the two-State solution and “we must think out of the box to mediate peace”. He recalled that 19 September had marked the twelfth anniversary of the Six‑Party Talks Joint Statement, in which the parties, including China, had formulated a road map towards denuclearization of the Korean Peninsula. While some felt that statement was now outdated, such peaceful trends never became obsolete. There should be no new nuclear weapons States, he stressed, urging the Democratic People’s Republic of Korea not to advance its dangerous direction, and calling on the United States to honour its regional commitments. There was still hope for peace and “we must not give up,” he said. The parties must meet each other halfway. China had made tireless efforts for peace on the Korean Peninsula and would stay firmly committed to its denuclearization. He underscored the need to help States implement the 2030 Agenda in line with their own needs and priorities, pressing the United Nations to continue its follow-up of the Paris Agreement, and parties to respect the principle of common but differentiated responsibilities. He encouraged States to seek complementarity between the 2030 Agenda and their own development strategies. North-South cooperation should be used as a main channel for development while leveraging South-South and tripartite cooperation. On the refugee crisis, which stemmed from regional instability and uneven development, he said the United Nations must respond by easing the humanitarian plight and addressing its causes. It should also promote trade and investment, build an open world economy and pursue innovation, ensuring that all countries enjoyed the same rights and shared development achievements. It must promote the uniform application of international law and help rebalance globalization to the benefit of all nations. China’s progress would bring more benefits as an “anchor of world peace,” he said, adding that it had never — and would never — pursue colonization or aggression. China would “always vote for peace” in the Security Council. A champion of multilateralism, as well as of the principles of sovereignty, independence and territorial integrity, it would always uphold its obligations.